Individuals with autism who lack the skills to communicate with the larger world are often upset. Part of that upset comes from the inability to predict everyday events and to express basic wants and needs. But a deeper cause of the upset is often the feeling that others don't truly understand their thoughts and emotions and why they find a certain situation difficult or intolerable. School recess was often a distressing time for Adam - too many kids, too much action, too many interactions. We frequently dealt wih post-recess upsets during his early school years, with Adam unable to calm down or say what was wrong. In grade 4, we had a break-through. A classmate of Adam's came in after recess and told the teacher that she had seen another boy harassing Adam at recess. 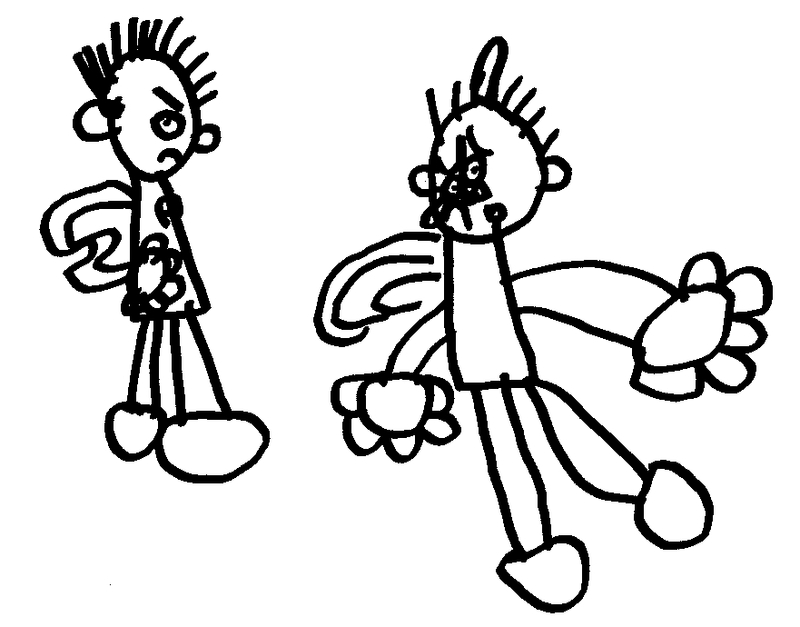 I sat down with Adam, and drew a picture of the boy kicking him. Adam was crying and nodding his head and repeating "no kicking". 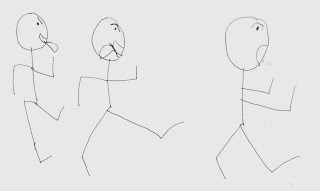 I drew a red circle with a stroke through it over the picture, reassuring him that this was not allowed, and that the teacher would make sure that it didn't happen again. For the first time that school year, he was able to calm down and do his afternoon school work. 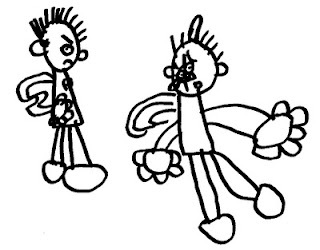 What was key in this situation was the clear visual communication to Adam (through drawing) that we all knew what had been happening on the playground, and the follow-up message (transmitted through the red circle over the picture) that it was against the school rules and that the other boy was in the wrong. The relief that Adam felt over finding out this information was palpable. 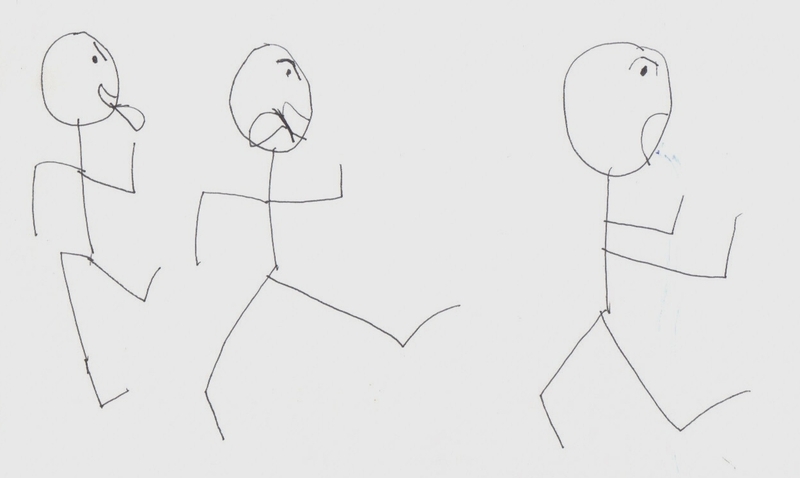 In real life, Adam never touched the boy, never acted out what he drew - but the drawing of these pictures seemed to give him closure on the incident, and he was able to move past it. We are all familiar with this type of mental problem-solving (the "why I oughtta ...!") and it helps us to function in our daily lives without clonking all the people who annoy us on the head. This is a higher level function of communication than simply transmitting basic wants and needs. It reflects the use of imagination to work through something mentally so that it doesn't remain an insurmountable problem in the real world. 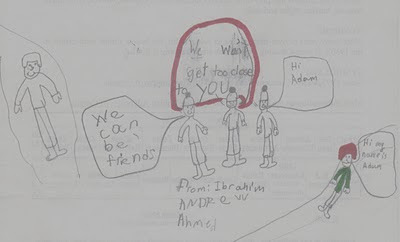 The drawn apology helped Adam to become calmer about the situation, because it confirmed for him that people understood his point of view, he had rights and the school rules would protect him. At the same time, the other students and teachers gained respect and understanding for the feelings and perspective of the real person behind the silent exterior. 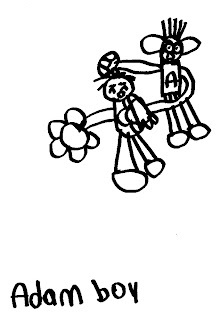 Real communication is so much more than pointing to pictures of objects and activities, and being able to indicate "yes" and "no". 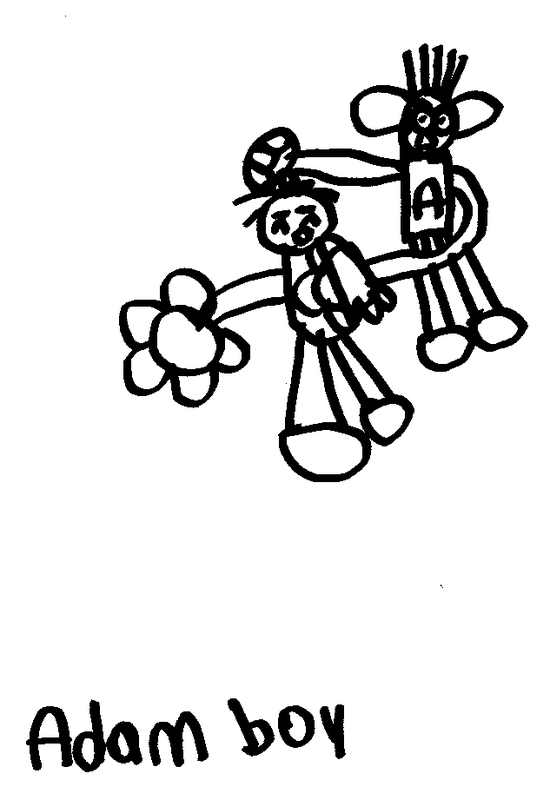 The strength of drawing for communication is that it gives non-verbal ASD individuals a way to express more subtle and higher level thoughts and feelings. This type of communication builds confidence and a real sense of control and belonging in a world that is too often arbitrary and unpredictable from the ASD perspective.